I’ve been very busy printing some difficult prints, so of course, like a squeezed balloon, the pressure bulges out somewhere else. That seems to be the way I work; I get a lot of energy for something besides where the real pressure is. In this case, I took my scanner apart and cleaned the inner glass, which had been unusably crudded up with film from the outgassing plastic. I hadn’t really been able to scan any of my old sheet film in years. So yesterday I went down a rabbit hole, scanning all kinds of sheet film from the early 80s, when I was young and skinny and Serious About Photography. Yesterday, I re-fell in love with black and white film, again. The subtle silvery tones and haze of light graininess: Oh! I swam in the silvery tones as each scan completed (they take a long time, at high resolution with this big film). It was rather like darkroom developing, turning on the light after the film comes out of the fixer to look. I used to print softer and more subtly than the Pop! that is more compelling and in easy reach with modern lenses and sensors. I remembered that in a good way. Damn, all these years later, I AM a photographer. Most of my life I’ve lived this vision, and it’s made me richer in spirit, if poorer in purse. So anyway, I will be posting some of those (and other!) scans someday, but in the meantime, I would also have been pleased to get the image above, back in the film days. It’s kind of a bridge, a subtle silver smoothness from the old days, married to a modern snappiness of tone that I would have been pleased to pull off in those old days too. 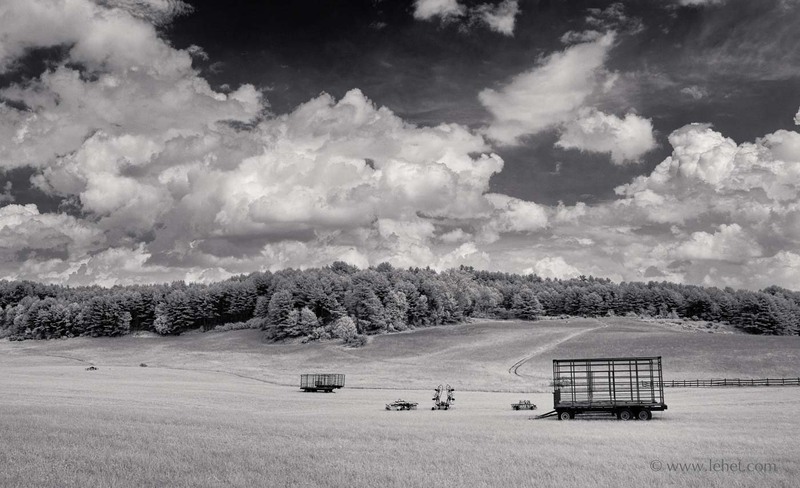 This entry was posted in black and white, New England, Panorama, summer, Vermont on May 23, 2015 by john lehet.